To thrive in the world of change, companies need to continually shift the way they do business. The challenge faced by leaders is to move their part of the organization towards greater agility so that they and their teams can thrive in a changing environment – and that’s easier said than done. Organizational change typically causes uncertainty, fear, posturing, and decreased performance brought on by the inherent chaos of a new way of doing things. Creating an Organizational Change Roadmap of the key changes you’re facing helps clarify the different elements of the change process that you are engaged in. This clarity is required not only for those people who are affected by the change, but also by those leading the change to combat the natural negative reactions to organizational change. The above illustration shows an example of how change affects organizations. 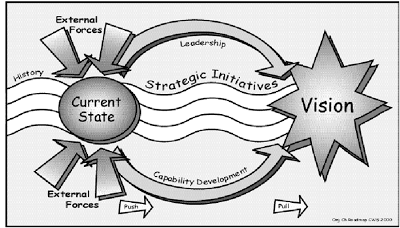 First, external forces push the organization to move out of its current state. 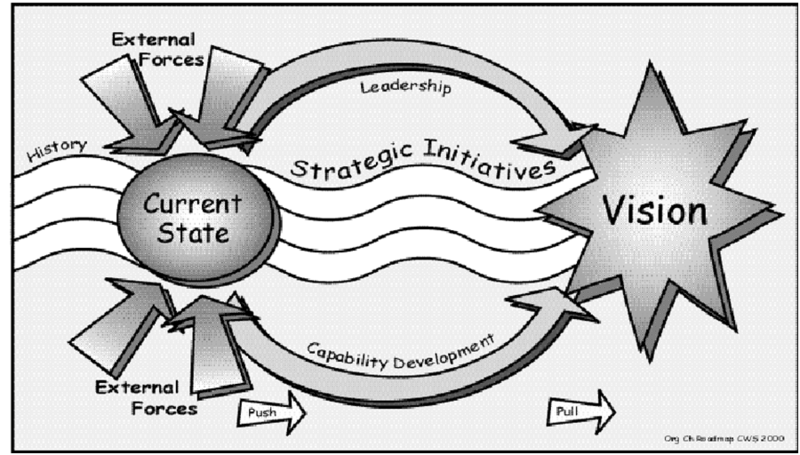 Then, the organization takes positive actions to move itself toward its desired state. Do not underestimate the need for clarity in all of the areas to successfully lead and manage change.